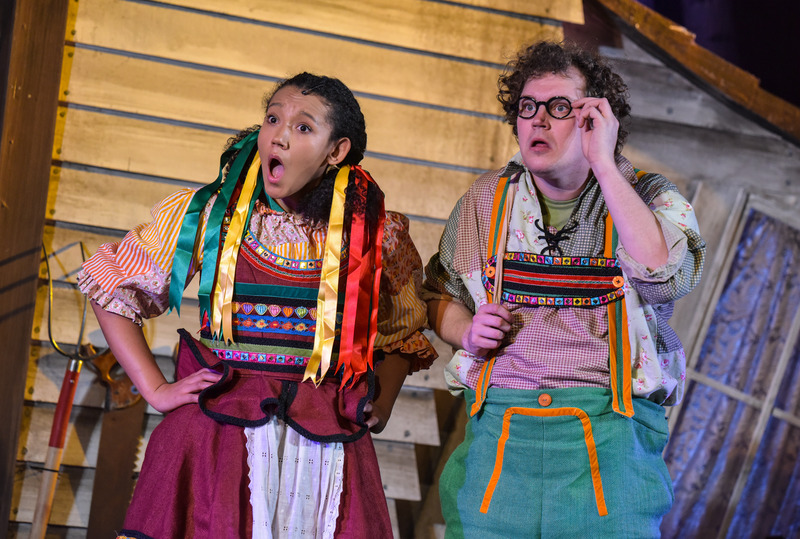 Review: Hansel and Gretel. Derby Theatre – East Midlands Theatre. 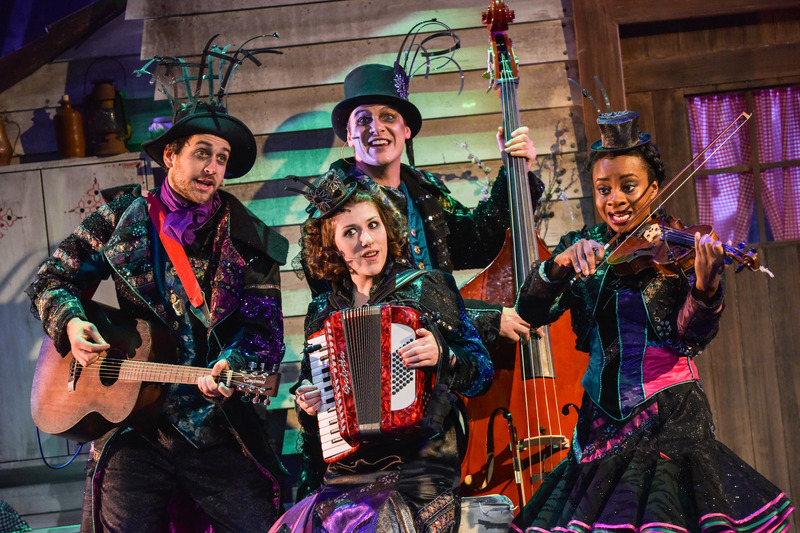 For a scrumptious, festive family treat, head to Derby Theatre for the sugar-coated, deliciously dark and fun-packed Hansel and Gretel. With mouth-watering original music, a feast of talented actor-musicians and a lusciously designed set, it is a delight for all the senses. This well-known fairytale is uniquely told by a ‘parliament of rooks’, who sing and dance and squawk their way throughout the tale, acting as observers, commentators and sometime friends to the lost children. The rooks appear in a sort of steampunk meets traditional gothic style, their costumes made sumptuous with yards of fabric, pleating and layers, all of which create a fully-feathered effect. And because it’s (nearly) Christmas, there is glitter and embellishment aplenty. The dark origins of the tale of Hansel and Gretel have been cleverly adapted by Mike Kenny into a rather more palatable story suited to today. The original, from a folklore tradition, has the parents abandoning their children in the woods to stave off hunger – here, the mother and father simply hope to teach their kids a lesson – but the result is the same. Hansel and Gretel get lost in a deep, dark wood, and come across the most appetising sight – a house made of gingerbread! The image of a cabin made of cake and sweets must be etched in the mind of every child who ever read the story – a confection of sugary, shimmering tastiness – and the delectable design of the house on stage meets the very high expectations of everyone’s imagination. It is encrusted with lollipops and candy canes, topped with frosting and complete with sugar windows. In fact, the whole set creates an other-worldly feel, with a simple black and white illustrative style brought to life with moveable, 3D sections and colourful, creative lighting. 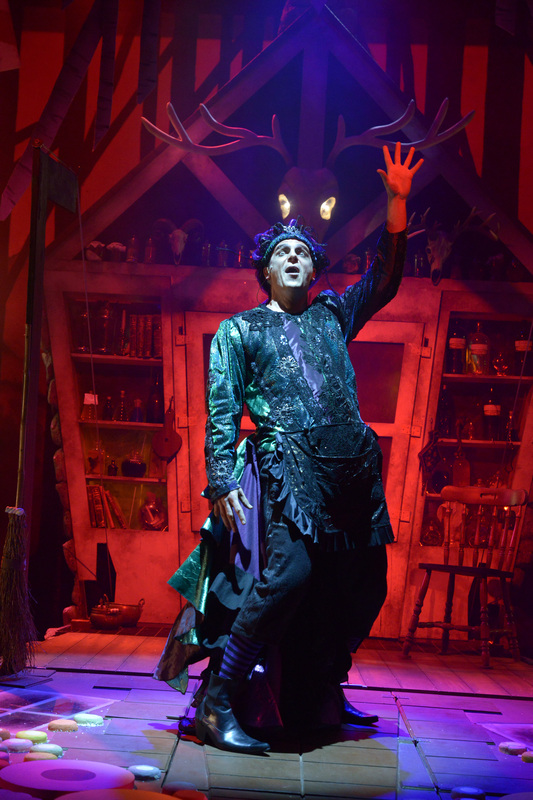 Neil Irish is set designer and costumes are by Tim Heywood. It is properly enchanting. The owner of this flavourful cottage is the myopic ‘Ginger the Witch’, a marvellous creation with glittery purple dreadlocks, an enormous bustle and an unusual favourite dish – boy, roasted, braised or fried! 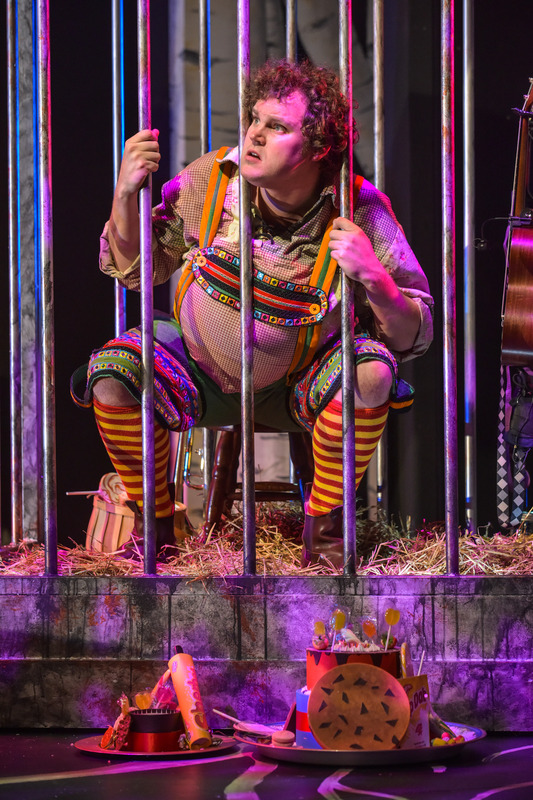 Ginger (Chris Price) leads the rather psychedelic, sugar-fuelled overload that is the song ‘Home Sweet Home’, with the young company appearing as actual sweets. Oh, and quite a few well-known fairytale characters appear to be lost in the woods too – a wise Little Red Riding Hood who outwits the wily Wolf, a whiny Goldilocks and some very cute and cuddly bears. 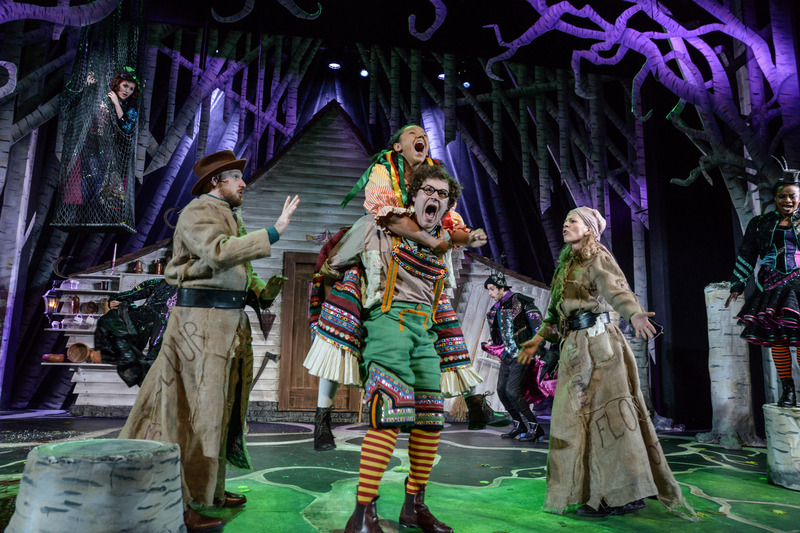 The small cast play multiple roles and multiple instruments and do it all with enormous energy and commitment, creating a really magical and unusual production. The terrifically catchy songs and production music are composed by Ivan Stott. 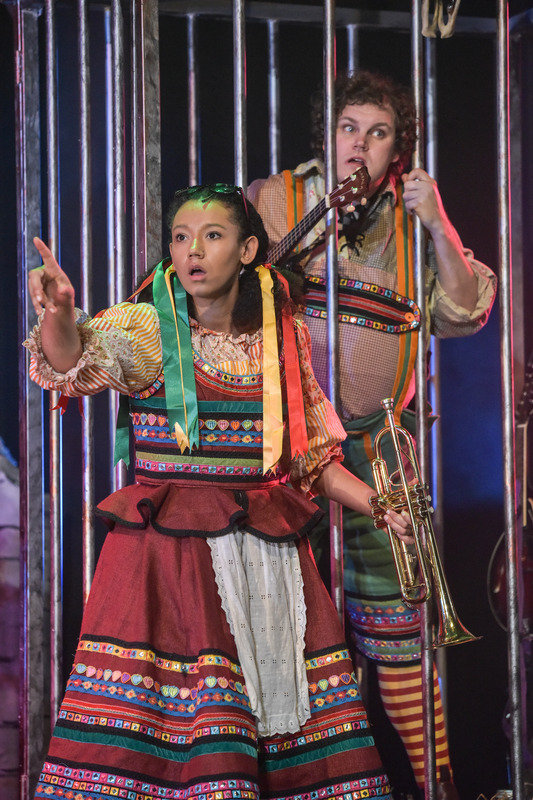 Hansel (Craig Anderson) and Gretel (Yana Penrose) win our hearts as regular kids – a bit cheeky, a bit greedy, but resourceful, know what’s right from wrong, and with some ingenious ideas up their sleeves for getting the better of the grown ups! No princesses here, just everyday heroes who win the day. And … they get to eat a mountain of marshmallow and a shed-load of sherbet on the way! This is an original, unexpected and charming production written by Mike Kenny and directed by Sarah Brigham. 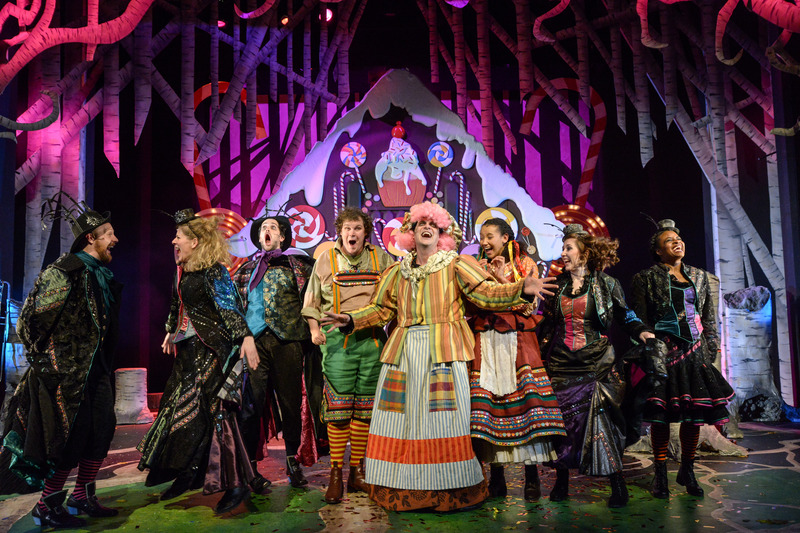 It is full of all the joy and jeopardy you want from a festive production – pretty much like a mouthful of popping candy!! Derby Theatre have a sweet success on their hands and will undoubtedly be enjoying ‘Happy Ever Afters’ for some time to come.